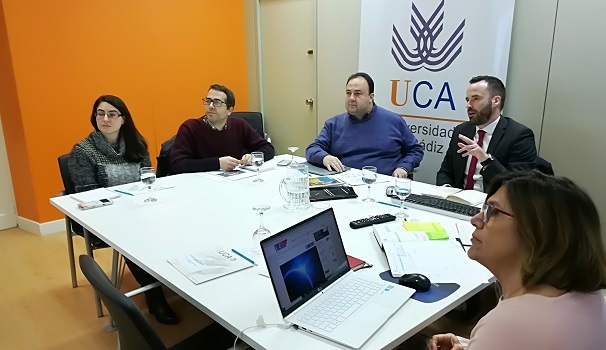 On February 18, 2018, an informative session was held at the Rectorate, addressed to a representation of the Management Team of the UCA, about The World University Ranking promoted by Times Higher Education. Since 2004, THE, the Times Higher Education weekly magazine, provides a ranking of the best universities in the world evaluated through teaching, research, citations, international perspective, reputation and industry income. Nicolas Cletz, Regional Director of this ranking, took part in the session, which was organized by the Delegation of the Rector for Strategic Development. The Vice-Rector of Research, Casimiro Mantell, thanked THE for the displacement to Cádiz and the quality of the informative session.